In the 1970s, no one could have imaged that 20 years later, the best-selling roadster would be something other than a Brit or an Italian. In the 1960s and 1970s, the Brits and the Italians dominated in this sector with models that just kept getting better, such as the Fiat Spider, the Alfa Romeo Spider, the Triumph Spitfire or the MGB. However, it was in the 1970s – when the United States was shaken up by the oil crisis – that Japanese cars began to quietly emerge. They were initially greeted warmly (the United States and Japan were arch-enemies during the WW2 era), but by supplying economical, reliable and affordable cars, the Japanese quickly found a fast-growing group of loyal buyers. The glory of the Brits and the Italians in the States was already depleted in the 1980s. Outdated models, quality issues and short-sighted management led to a dramatic drop in the popularity of their roadsters. 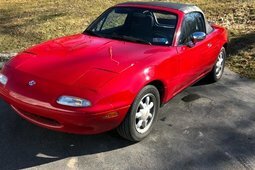 Meanwhile, Mazda was on the rise and saw this as an amazing opportunity, realizing that people were not buying roadsters not because they didn't want them, but because there was a lack of good products available on the market. The beginning of the Mazda MX-5 concept can be traced back to the late 1970s, when Bob Hall – then a journalist at the American automobile magazine Motor Trend – met the head of Research and Development at Mazda, Kenichi Yamamoto. Bob explained enthusiastically that he believed that a modern, affordable roadster based on the British example would be a big success, since the models that were currently on the market were already outdated. He even drew a sketch of how the model should look, and this seemingly made a big impression on Mazda, since three years later, Bob Hall was already working for Mazda's US design department. Given, he was officially assigned to work on projects for a pick-up and a minivan. But Bob never let go of his idea and when he and his team had some time away from their main projects, they created a full-size model for a small, light, sporty roadster. Taking cues from the Lotus Elan, with its classic front-engine, rear-wheel-drive layout, their roadster won them an internal competition, beating out two other proposals from Japan. Mazda liked the idea and commissioned International Automotive Design in England to produce a fully operational prototype, which they later called the V705. By the autumn of 1985, they had a one-off, fully functional V705 which was taken to the US for tests in Santa Barbara, California. 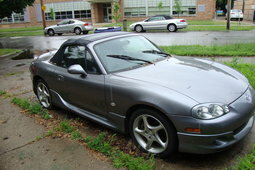 The prototype got such positive reactions that Mazda had no choice but to give it the green light for mass production. And a few years later, Mazda unveiled its mass-produced Mazda Miata (which is what it was called in North America – in Europe it was marketed as the MX-5) at the 1989 Chicago Auto Show (which was selected because Detroit was not very friendly to newcomers at the time). With Honda launching its NSX supercar there at the same time, the Miata wasn't the star of the show, but it was the future star of the market. The starting price of USD 13,995 was more than good for a roadster that was so lightweight and that handled so well. The 4-cylinder, 1.6-litre, 120-horsepower engine was plenty for this car that weighed just over a tonne and featured a fantastic 50:50 weight balance. Sure, it wasn't the fastest (with 0–100 km/h in about 9 seconds) or the most powerful roadster around, but its smile-to-horsepower ratio was one of the best in the market. There was such demand that during the first two years, buying a car at Mazda's recommended price was like winning the lottery. 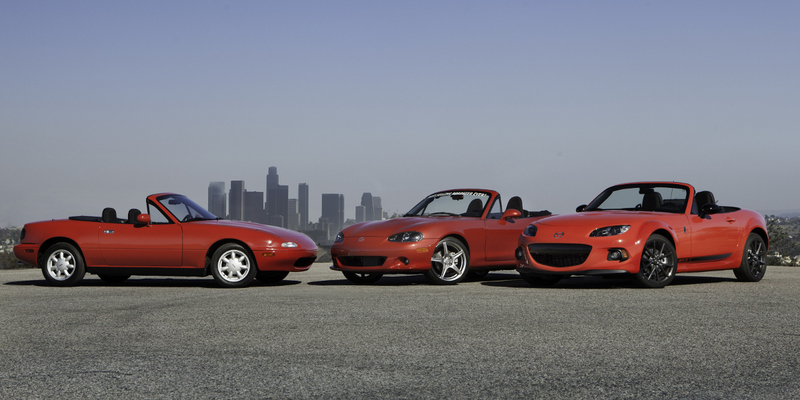 Mazda had planned for about 20,000 units per year in the US, but they ended up selling almost twice that. Demand was also solid in Europe and (a bit unexpectedly) in Japan, where instead of the planned 500 cars per month, they were selling 2,000–3,000. In ten years, 400,000 first-generation (NA) vehicles were sold, which was more than the MGB – which was the leading roadster up until then – had ever achieved. And the rest is history: the second generation (NB) was launched in 1999, followed by the third (NC) in 2005, and the fourth (ND) came out a couple of years ago, in 2015. All generations combined, over a million MX-5s have been sold, and this is a Guinness World Record for the best-selling convertible two-seater sports car. There aren't that many car models that all classic car experts would so unanimously agree on like they do on the first-generation (NA) MX-5. This open-top sports car is guaranteed to become a classic, and if you don't get one now, you're just going to have to pay more later, so there can only be one piece of advice: buy yourself one now. And you can consider yourself lucky that so many were produced. You can find a good car for as little as USD 5,000, and it's one of the best buys in the future classic market.